Combine the beauty of nature with the enchanting sounds of moving water with this delightful Bi level Jug Fountain with Planter. A sleek planter sits at the top of the fountain center as water bubbles over into the round base beneath. Ideal as a focal point for your garden, made of glass fiber reinforced concrete GFRC to give the genuine texture and appearance of stone that will outlast traditional cast stone, and at a substantial weight savings. 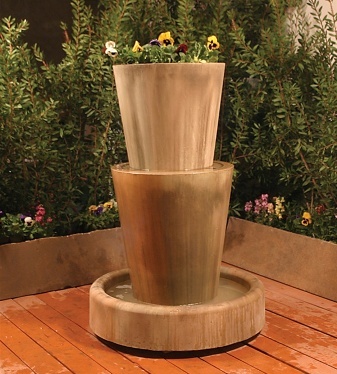 Our fountains provide value pricing, superior craftsmanship and minimal maintenance. No plumbing is required, as water recirculates within the fountain. Made to order and ships within 4 to 6 weeks, arrives securely packed on a pallet. Shown in Sierra finish.